Real estate teams have evolved into a powerful business strategy for solo real estate entrepreneurs looking to expand their operations and become more profitable. The hype is undeniable but unequivocally valid: When organized and operated correctly, real estate teams offer numerous benefits that agents would struggle to achieve on their own. Here are some attractive advantages of real estate teams—as well as a few items to consider once your team is in place. This is a no-brainer: You only have so many hours in the week to run a business on your own, but with a team, you add the resources to follow up with more leads, take on more clients, and sell more homes. The challenge, however, is growing fast enough to sufficiently pay the new members of your team and have enough increased revenue for yourself. All those hours you pour into your business can take a toll on your non-work life. By starting a team, you don’t have to choose between a 70-hour week or spending time with your family—other team members are there to handle some of the work (especially the essential but time-consuming busywork) in order to reach sales goals. As a real estate agent, you may have goals—not just revenue goals, but clear objectives regarding the type of business you want to run, the clientele and geographic area you want to serve, industry and community advocacy, and other priorities. Ironically, a successful career as a solo real estate entrepreneur can interfere with many goals because all of your time is spent sustaining and building the success rather than using it as a means to achieve your overarching plans. When you start a team, others can take the lead on critical tasks and you can focus on the real estate career you want to build. Similarly, leading a real estate team that you’ve built offers a certain degree of flexibility and freedom to run your business the way you see fit. This latitude is something agents in large agencies don’t often enjoy, but it’s also something that solo entrepreneurs struggle to reach because the realities of the business demand operating it a certain way. With a team, the running of the business itself won’t hold you back. Creating a team and adding a few people to it expands the business, but you could run into another favorable dilemma: hitting a workload limit (again) on what can be reasonably accomplished. Fortunately, real estate team structure offers an inherent path to scalability and growth. Taking the first step toward forming the team is the big move; expansion after that is simpler but no less exciting. Your business structure may change with a team, but certain expenses won’t. Teams help reduce costs so that you keep more revenue than you might have on your own. For example, with experts in-house (particularly transaction coordinators), you personally aren’t spending time on tasks others can handle. Transaction costs ultimately decrease, thus creating room for more growth, which can then lead to more expense reduction, and so on. Teams that partner with a team-friendly brokerage can save even more money. The best brokerages offer technology, tools, and resources that streamline processes and reduce expenses. The key is clearly establishing what the team will provide and what you will need to pay for. Once that’s set, you can take advantage of the partnership to increase profits and reinvest in your business. Outstanding teams are more productive than the most dynamic solo real estate entrepreneurs can hope to be. Team members focusing on their particular areas of expertise perform tasks better than one person trying to handle everything. This specialization increases productivity that benefits you, your team, and your clients. Team culture defines the business environment of your organization, as well as people’s commitment to your mission, working together, delivering the best service to the customer, and taking care of the finer details that ultimately contribute to success. When team members don’t subscribe to your culture, the team suffers. When a team culture isn’t living up to someone’s expectations, the urge to leave becomes strong—and the team suffers when that departure finally happens. 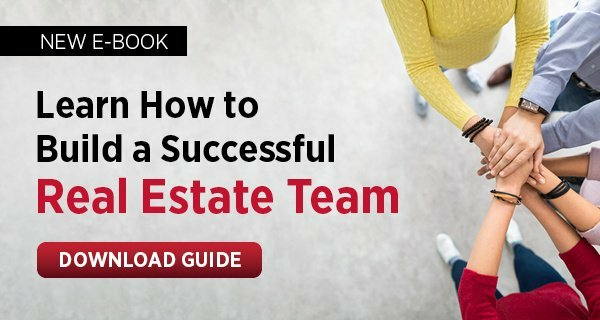 Create a real estate team that people will be proud to be a part of. They, in turn, will deliver outstanding work, which will make your culture even stronger. Real estate teams work best when everyone knows their roles, responsibilities, and expectations. Although the idea of “we’re all working together!” is nice, the fact is, to work together best, roles must be defined so that tasks and projects are completed on time by the people most qualified to do them. Lack of defined roles leads to chaos, especially when a team member’s hard work is wasted because the next follow-up task is never finished, much less assigned. This can quickly disillusion even the most committed team member and result in churn. This reason for churn is obvious: If your team isn’t getting enough leads and closing enough deals, the compensation won’t be there for agents and other support staff to want to stay. However, even with enough leads, compensation might still be an issue—even if you are generous and recognize that hard work should be rewarded. Team leaders constantly negotiating transaction fees with their brokers can find themselves slicing off of compensation for their teammates to make up for what was lost on the front end. This is where a team-centric, flat-fee brokerage can be a great asset. Without the constant haggling over fees, you can better cement a compensation structure with your team and minimize churn—and, most importantly, build success with people excited to be along for the ride. Should You Stay Solo or Form a Real Estate Team?